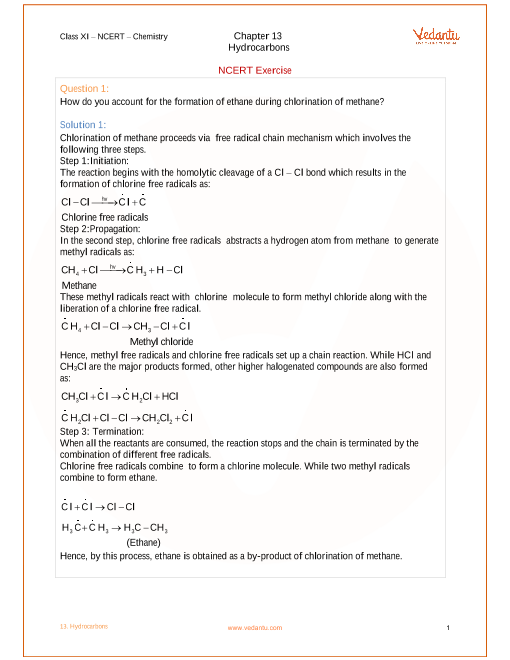 Vedantu.com - No.1 online tutoring company in India provides you Free PDF download of NCERT Solutions for Class 11 Chemistry Chapter 13 - Hydrocarbons solved by Expert Teachers as per NCERT (CBSE) Book guidelines. All Chapter 13 - Hydrocarbons Exercise Questions with Solutions to help you to revise complete Syllabus and Score More marks. Register for online coaching for IIT JEE (Mains & Advanced), NEET, Engineering and Medical entrance exams. Unit 13, NCERT Grade 11 Chemistry, Chapter 13, Hydrocarbons holds a weightage of 18 marks in the final examination in combination with Unit 12 and Unit 14. In this chapter, students can well understand the importance of hydrocarbons in their daily life. In this unit, students will learn more about hydrocarbons. After studying this unit, students will be able to name hydrocarbons according to IUPAC system of nomenclature; recognise and write structures of isomers of alkanes, alkenes, alkynes and aromatic hydrocarbons; learn about various methods of preparation of hydrocarbons; distinguish between alkanes, alkenes, alkynes and aromatic hydrocarbons on the basis of physical and chemical properties; draw and differentiate between various conformations of ethane; appreciate the role of hydrocarbons as sources of energy and for other industrial applications; predict the formation of the addition products of unsymmetrical alkenes and alkynes on the basis of electronic mechanism; comprehend the structure of benzene, explain aromaticity and understand mechanism of electrophilic substitution reactions of benzene; predict the directive influence of substituents in monosubstituted benzene ring; learn about carcinogenicity and toxicity. Through in depth learning of NCERT Grade 11 Chemistry, Chapter 13, Hydrocarbons; students will master the concepts of Classification, Alkanes, Nomenclature and Isomerism, Preparation, Properties, Conformations, Alkenes, Structure of Double Bond, Nomenclature, Isomerism, Preparation, Properties, Alkynes, Nomenclature and Isomerism, Structure of Triple Bond, Preparation, Properties, Aromatic Hydrocarbon, Nomenclature and Isomerism, Structure of Benzene, Aromaticity, Preparation of Benzene, Properties, Directive influence of a functional group in monosubstituted benzene and Carcinogenicity and Toxicity. Get 100 percent accurate NCERT Solutions for Class 11 Chemistry Chapter 13 (Hydrocarbons) solved by expert Chemistry teachers. We provide solutions for questions given in Class 11 Chemistry text-book as per CBSE Board guidelines from the latest NCERT book for Class 11 Chemistry. The topics and sub-topics in Chapter 13 Hydrocarbons are given below. EX 13.6 - CARCINOGENICITY AND TOXICITY. Chapter 13 - 25 Questions with Solutions. Other than given exercises, you should also practice all the solved examples given in the book to clear your concepts on Hydrocarbons. Download the free PDF of Chapter 13 Hydrocarbons and take the print out to keep it handy for your exam preparation.